We traveled to a choir concert in last month’s post. Today’s “story” is very much more simple, because I am very much too busy to blog lately and am behind on this publishing this post! What a great month it has been overall. My family and I were showered with blessings and special memory-making moments. In today’s post, I could recount stories about our silly antics on a shopping trip or during the holidays. Or, I could capture in words a poignant moment of deep sorrow or friendship, or a life-changing event I witnessed in one of my friend’s lives. Rather than go into such detail, I’d like to simply mention something which brought me great happiness this month — a thing many busy Americans long to find. Can you see the thing I’m talking about in the photo above? Do you know what provided one of my greatest pleasures recently? That’s right…You see it…It is NOTHING. An entire week of nothing scheduled and nowhere to be at a certain time. OK, there wasn’t actually seven days in a row of nothing, but in the space of two weeks my daughter and I had at least 5-7 days of pure relaxation. It was wonderful! Usually for my daughter’s homeschool we plan only one week off for Christmas so that we can have an extra “spring break” when we are feeling burned-out from studies. This year she suggested we push summer break back a week so we could have the typical two weeks off for the holidays. I was very receptive to this idea because we spent most of the first holiday vacation week catching up on her school work (my daughter has been sick more often this fall than ever in her entire life, and we were quite behind on her work). That extra week off was blissful! It was just what we needed to get us rested and energized again. You would never think someone could get so excited about nothing, eh? After reading through the selections, she says her favorite one is the post from July. That makes sense because it was a sweet, heart-warming event that involved an adorable baby. 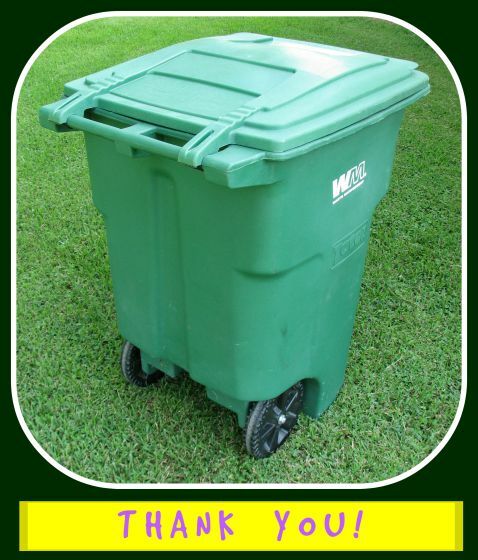 Last spring, the trash truck would come by every Friday morning while I was homeschooling my daughter, and we would usually hear the noise and peek out of our high living room windows to see if a visitor had pulled into our driveway. One of the workers noticed and started watching for us and waving to us each week; it seemed to entertain him. I observed the men loading the smelly garbage into the truck, and began to think about the rain, heat, and cold they worked in throughout the year. I thought how they were frequently in danger from impatient drivers zipping past the garbage truck, stray dogs, glass, chemicals, and the germy refuse that splashed out of the trash cans. Seeing an opportunity to teach my daughter about compassion for others, I talked to my her about the subject of unappreciated, unpleasant jobs as we watched the truck continue down the street. We decided as a result of our discussion to leave the workers a thank you note the next week. Our trash can sat by the street on the following Friday with a large piece of bright-yellow posterboard taped to the lid. Written on the posterboard was a letter about how the garbage collectors’ jobs seemed to us to be difficult and usually ignored or unappreciated by most people. We stated that the town would be a disgusting mess without them working hard to gather people’s trash every day and that we wanted them to know we appreciated their efforts. When we heard the squeaking brakes and roaring engine of the approaching trash truck, things quickly became very cloak-and-dagger at our house. Overcome with embarrassment and fearing the trash workers might think us insane for leaving such an unusual note on our can, we threw the curtains closed and waited. The truck pulled up in front of our house and idled for a long time. My daughter and I sneaked around to a different window and peeked out to see the friendly waving worker hand the posterboard note to the driver in the front of the truck. Searching the house with his eyes, he proceeded to empty the trash from our can, close the lid, and slowly wheel the can all the way up into our carport before walking back to the truck. For several months now, that worker has returned the empty trash can into our carport every week. Once, I forgot to set the can out by the street, and he took care of everything for us. Any time he sees us in the yard or looking out a window, he waves and yells hello with a big smile on his face. It seems that our simple gesture of gratitude made quite an impact on the man. Everyone enjoys being appreciated. Have you ever noticed in your own life that it is easier to work hard at something when you know that someone really appreciates what you’re doing? If no one cares about what you’re doing, or worse, if people continually complain about how you do it, it can make you think about throwing up your hands and quitting, right? Ugh! The trash guys left my empty can too close to the street! Hey, man, someone could have run over my can! Why don’t you do your job right? I’m glad it’s trash day. Thanks, mister, for working hard for us and for hauling that bag with the stinking, rotten meat off my property! You deserve a bonus! There are “little things” in life that are not so little when you think about it. Being thankful for the good things in our lives, whether they be big / important things or little / seemingly insignificant things, adds a richness and joy to life. OH! Where are they? Ugh, I know I set them down over here somewhere! Where are they?? … Hey, has anyone seen my glasses? I’ve looked all over the place, and I can’t find them! Glasses may seem like a nuisance or inconvenience, but when you want them and can’t find them, you realize how important they are. My husband has rarely ever searched for his misplaced glasses because he only takes them off to sleep. Without his glasses he is almost legally blind, but with them he is able to work in a career that centers around using vision. His entire livelihood is dependent upon those two little lenses. Personally, I dread the thought of having to wear glasses all the time, even knowing what a blessing they are. I see them in my near future, though. For almost a year now, I’ve become aware that my eyesight is changing. Last week, I had to get a magnifying glass to be able to thread the needle on my sewing machine. Think how different the world was before “spectacles” were invented. 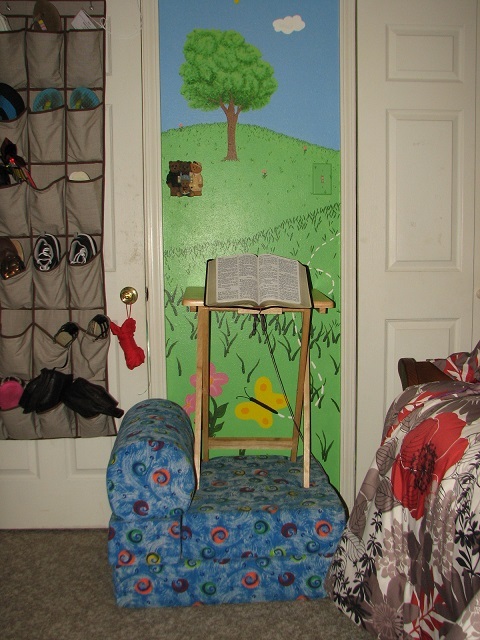 Those little lenses can be a life-changer, and those of us who have access to such aides are very blessed indeed! This great blog post discusses the importance of positive communication. May we all remember to acknowledge those we appreciate! Have you ever had that feeling that no one appreciates you? Have you ever thought that maybe you aren’t the only one who feels this way? 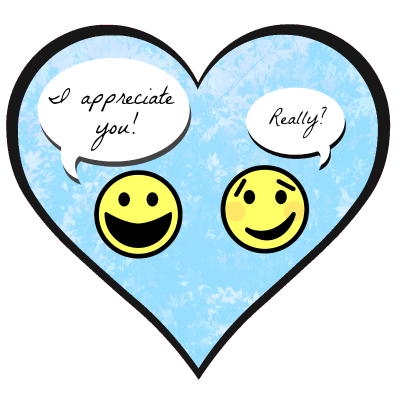 Appreciation is a wonderful thing, especially if you show it. A friend of mine recently sent me a letter that simply said how much he appreciated and cared for me. It made me smile and the rest of the day I felt so happy. Many people will do things for others for absolutely nothing, no smile, no thank you. That’s a wonderful thing to do! Everyone should give and not expect to receive. But what if they got one thank you a day? How much more motivated would they be? What if you got a thank you a day? Appreciation is something that should never be hidden. If you want a thank you a day, give a thank you a day! 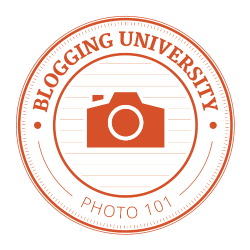 Day 4: Today’s theme is “Bliss,” and the lesson is on how to add captions, alt text, descriptions, etc. to your photos. Bliss to me is one thing: MY HEAVENLY FATHER. I love God and all the wonderful things He has done for me. He is so good to each and every one of us, whether we appreciate it or not. 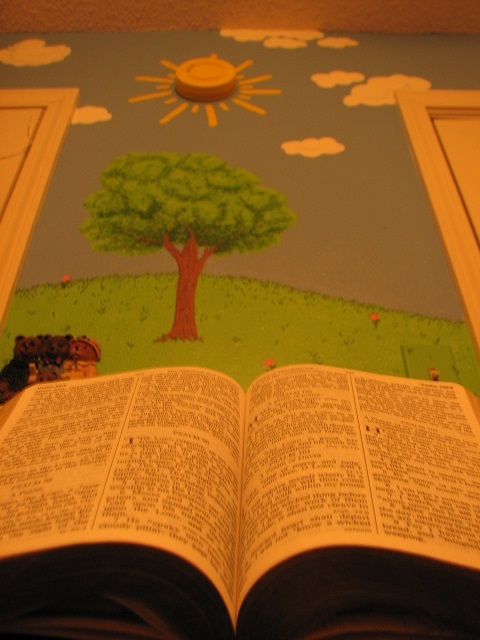 This photo includes a bible and a mural in my daughter’s room and is what I chose as a symbol of God and His creation. I kept the camera on the “Aperture Priority” setting for all my shooting today, which is designed to optimize the lighting in photos. It often allows the flash to work and produce a better-quality photo during situations when the “Auto” setting seems determined to take bad photos without the flash. You will think me crazy when you see what I set up in order to be able to capture this photo by myself. I ran a string behind the bible’s binding and tied it to a t.v. 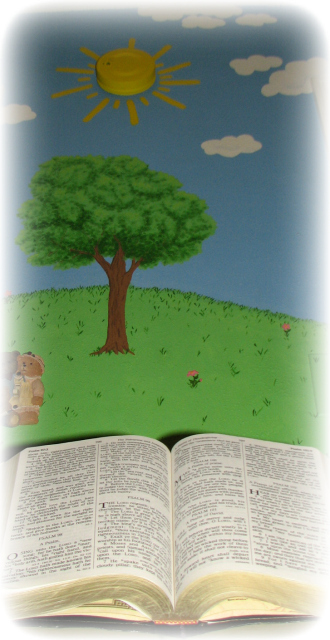 tray with another bible propping it up from behind. Miscommunication: There is a misunderstanding or disagreement, so people stomp away angry rather than trying first to clarify what was said. Why do people sometimes act like it’s more important to be right than to be friends? Does it have to be that way? After putting extra effort into understanding another person’s point of view, people occasionally find out that they were trying to say the same thing and had no reason to be upset at all. In some cases a little compromising will solve the issue. Other times more thought or study on the topic will settle the disagreement. No communication: A person feels isolated and lonely in a crowd because even though people nearby appreciate and care for the lonely person, they never take the time to tell them so. Isn’t there at least one thing to appreciate in any person? Why not encourage the person by letting them know? Also, there are times when people are suffering because a person who could help alleviate the problem will not speak up for what is right. When is this acceptable? Who has made a positive impact on you? Whom do you care about? Make sure you tell them as soon as possible (and as often as possible, too). Wouldn’t life be more pleasant if everyone felt noticed, appreciated, and loved? One thoughtful word or deed usually leads to another, so go start the ball (of kindness) rolling today!